The Esprit by Spirit EL-3 Elliptical is an outstanding trainer priced at under $1000. It is based on the popular Sole E35 and comes with advanced features such as a 2% foot pedal incline, a smooth and natural 20" stride, and 16 resistance levels for a challenging workout. The Spirit EL-3 Elliptical features a precision-balanced 24-lb flywheel, high quality components, articulating foot pedals, and a large blue backlit display that shows your workout stats — time, speed, calories, program, RPMs, level, distance, Watts, and pulse. Spirit is still smarting from the problems that surfaced with the debut of their XE Series, so they went back to the drawing board for something new, and came back with something old — and proven. Dyaco, which manufacturers both Sole and Spirit, repackaged the highly regarded Sole E35 elliptical, painted it white, and viola! — they have given us the Esprit by Spirit EL-3 elliptical. To make the deal sweeter, they even sliced $300 off the price. Forget the XE-Series trainers by Spirit; this redesigned Sole elliptical trainer is well priced and holds its value. 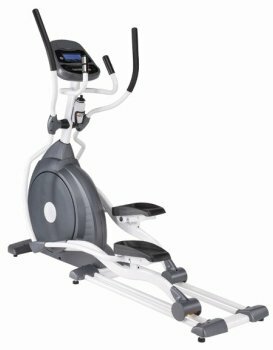 The Spirit EL-3 is a no-brainer for quality: if you have been researching elliptical reviews, you already know the Sole E35 has been an award-winning machine, and has been on many Best Buy lists, for several years. The EL-3 is the same model, just painted titanium white. It feels like a commercial machine, offering a long stride, heavy flywheel & frame, and the 2% incline pedals that Sole machines are known for. With its quiet operation and smooth, ergonomic elliptical motion, achieving your fitness goals will be a dream on this machine. At $999, the Esprit by Spirit EL-3 is a sure bet. It’s listed as having a 24-lb flywheel but it seems to have every bit the smooth performance as the more expensive sibling, the EL-5, which offers a 30-lb flywheel. This is a solid elliptical that is not that different from the EL-5, save for the heart rate control programs and the increased Watts. If you can’t find the EL-5 on sale, the Spirit EL-3 Elliptical is an affordable alternative and rates as a Best Buy among machines that sell for under $1,000.